A new packet of shrink-wrapped state tests will arrive at hundreds of elementary and middle schools across the region this week. But these 40-minute tests given in early June won’t count for students or teachers. They’ll test whether a private contractor, Pearson Education, hit the mark when it developed multiple-choice questions for state exams. It’s exactly the kind of class time parents such as Daniel Kasprzak think could be better spent. ...Pearson is a giant in the education and publishing fields. It publishes the Financial Times and prints books through the Penguin Group. Its education arm, Pearson Education, writes textbooks, sells school curriculum and designs tests taken by millions of children across the country. During the last decade, it has become one of the largest education companies in the world. The 40-minute field tests, which will be conducted in 220 schools in Erie and Niagara counties in early June, have prompted questions from some parents at Hillview Elementary School in Lancaster, said Principal Kathleen Carroll Knauth. "Pearson ’s approach to the education business can be understood by examining a recent controversy in which it found itself embroiled. The company moved decisively into the testing business well before its recent spate of acquisitions. 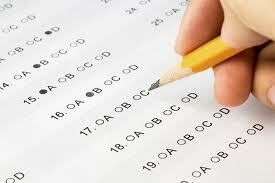 Along with other testing companies, Pearson grew fat feasting on the mandatory testing required under George W. Bush’s No Child Left Behind , and fatter still under Barack Obama’s Race to the Top . Pearson became a leader in testing as it did in so many other education businesses, by purchasing industry leaders. It bought National Computer Systems, the leading provider of test - scoring services, for an astonishing $2.5 billion US, in July 2000. 5 Several months later George W. Bush was elected president on an education — read “testing” — platform. Just days after the election, a NCS - Pearson executive displayed a quote from Bush calling for state testing and individual school report cards and announced to a ballroom - full of Wall Street analysts, “This almost reads like our business plan.” 6 In 2007, perhaps anticipating Barack Obama’s reliance on testing as his major education policy, Pearson purchased Harcourt Assessment, one of the two leading producers of tests administered at the state level and owner of the Stanford Achievement Test (SAT) , for $635 million." Pearson was intimately involved in the development of the Common Core Standards, was first to market with textbooks aligned to CCS and now has a controlling share of the standardized test market for CCS. The state's lame assertion that districts are free to choose whatever curriculum they want is proven false by this story. After all, if you were a New York principal and learned that Pearson included passages from their curriculum on the state test—the results of which are used to inform everything from student to teacher to school accountability—whose curriculum would you buy? So when the school tells you that your child HAS to take the standardized test, keep in mind this Tonawanda parent observation, “Basically, we have our children as child labor determining and enhancing the product for Pearson." Is it time to opt your child out of high stakes testing (and Common Core assessments)? Have you joined the Blue Hat movement? “The school day schedule is highly regimented and leaves very little breathing room. Teachers have been told that they are not allowed to include any activity unless it has documented proof of its educational benefit. For example, no art or craft projects that do not specifically relate to the curriculum (like decorating the classroom for holidays); no buddy reading (older students spending time reading with younger students); no silent reading time. The principal called these activities “fluff”. Parents should just protest this by keeping their kids home on that day!!! Better yet, choose an excellent non-common core curriculum and keep them home permanently!